Short drive to the sandy white beaches of Dauphin Island on the Gulf of Mexico. Come refesh yourself with family in this lovely waterfront home. Comfortable furnishings, screened porches to feel the soft breezes. Relaxing and peaceful. It has 3 bedrooms and 3 bathrooms. A large screened area for relaxing, barbecuing, or playing ping pong. You can fish from the dock, or sunbathe while viewing the river. Dauphin Island is about 15 minutes away. You can also visit the Historic Fort Gaines, the Sea Lab and Estuarium (with some hands on attractions that will fascinate the kids). Lots of restaurants, and the freshest seafood is right next door. The historical Bellingrath Gardens (10 minute drive) with its beautiful blooms all year is a sight to see. Takes about 30 minutes to get to Mobile with all the attractions there. We are now offering winter discounts for lengthy stays. Feel free to inquire about the reduced rates. My husband and I were both born and raised in the Mon Louis Island community. We are both sixth generation fishing folks. Together we own and operate a small seafood business, www.zirlottseafood.com, which is located on Fowl River next door to the River Cottage. We love the property and purchased it this year. We think of it as a part of our own home and hope that you will love it, too. Ask about the River Tours by boat. The view of Fowl River is very attractive and peaceful. An exclusive hide away from all the hustle and bustle of traffic and noise. A large screened area below the house is perfect for outdoor dining or playing ping pong, or just relaxing on the sofa, loveseat, and other furniture. There is also a screened upstairs porch, that is good for dining while viewing the river or reading, and just resting, etc. An outdoor shower is great for returning from the beach to rinse off the sand. Kids love it. The spacious house is very comfortable and beautiful. toilet, tub, shower, Large tub for soaking. Two sinks for convenience. Large side by side with ice maker. Easy to operate electric stove with large oven. Roomy Kitchen open to the living area. Lots of conveniences. Large table to accommodate 8 seats. Long bar with 4 stools. Large screened area under the house for dining, playing ping pong, or just relaxing. The house was immaculate when we arrived our host Patrician was kind helpful and easy to work with even during our planning phase. She was very knowledgeable about the area and surrounding cities. Definitely worth the drive. The rental was as presented and more than enough room for my husband and I to spread out and get comfortable. Unfortunately, the weather was not conducive to utilizing the screened areas upstairs or downstairs -- a little too chilly most days. Since both my husband and I are bird watchers, we thoroughly enjoyed walking around the property with our binoculars and were able to add a new sighting almost every day. We also brought our golf clubs and made the drive to Mobile to play several rounds. If you are looking for a well-appointed property "away from it all", this is a real find. There are a couple of markets 15 - 20 minutes away that offered everything we needed to prepare our meals. The kitchen has ample plates, cookware and table settings to accommodate a large crowd. Our hosts, the Zirlotts were delightful and have a wonderful selection of seafood products right next door. Our time away from the dreadful cold of Kansas City was great and we highly recommend this rental. Marilyn, we enjoyed meeting with you and exchanging bird stories. We hope you will return sometime and hopefully the weather will be better. Beautiful, spacious lake house that feels like home! The home was beautiful. The scenery was amazing. The kids loved looking for crabs on the pier. Beaches just a short drive away. We definitely had a relaxing vacation! Thank you! We love it when our guests feel at home. That is exactly how we want them to feel. This beautiful home has a great floor plan that was spacious and provided room and privacy for our family. The owners are wonderful gracious hosts. 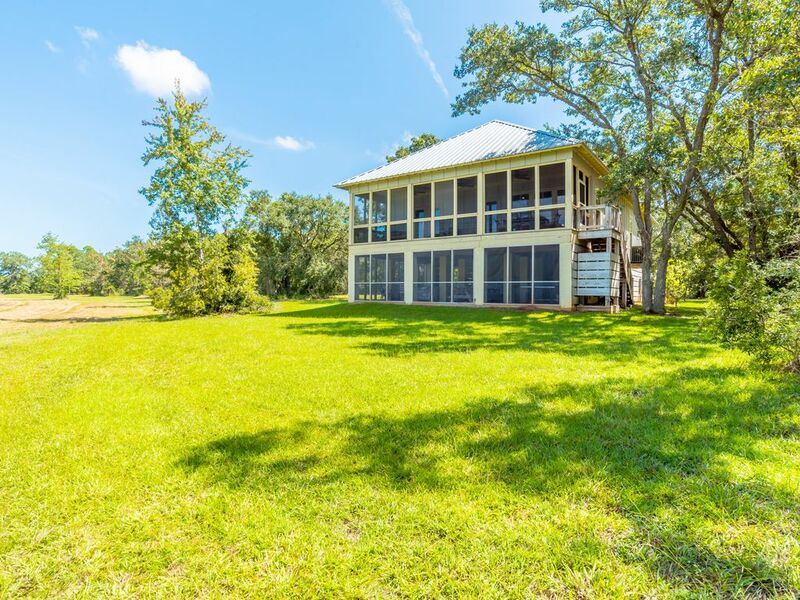 If you enjoy fishing, hanging out on screened in porches, going to the beach (close by) and quite surroundings - this is the house for you! We enjoyed having you stay at our home on Fowl River and hope you can return sometime. You left the house very clean and tidy. And we appreciate that. We loved having your family and loved being able to provide seafood for your anniversary meal. Look forward to seeing you again! Beautiful property in serene setting. This home is the perfect place to get away and unplug. Lovely home in a peaceful setting on the river and a short drive to the beaches. Great guests make the setting even better. Loved having you two. Look forward to seeing y'all again.